Valpo students are expanding the world’s knowledge about weather phenomena. 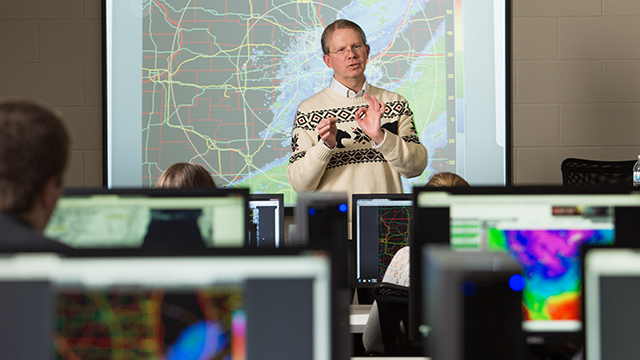 With superb tools and rigorous training, students in Valpo’s meteorology program have opportunities to investigate brand-new research questions. The often dramatic weather events of Northwest Indiana, from lake-effect snow to tornadoes, offer a rich source of research material, and students produce research that adds to the store of knowledge that ultimately helps make communities safer. Instruction in research methods begins in the classroom, and the department encourages majors to progress through research-based class projects to independent research. Students learn how to frame research questions, design projects, collect and analyze data, and present their research in oral, written and visual formats. Because communicating research findings is an important part of professional practice, students are encouraged to present their research at academic and professional conferences throughout the Midwest and occasionally beyond. These gatherings introduce students to the world and the work of professionals in the field, inspiring a lifelong interest in research and a thorough understanding of various geographic methods and techniques. Honors work is designated for students of exceptional ability who may benefit by earning a limited number of the credits required for graduation through supervised independent study rather than through regular course work. Students who apply for Honors Work should understand that their work will be evaluated according to the highest standards of scholarly achievement. A student who has completed at least 80 credit hours, but has not yet entered upon the work of the last two semesters, and who has a cumulative grade point average of at least 3.0 and a grade point average in the major of at least 3.5, may apply through the major department or program committee for admission to Honors Work. To apply, the student must submit a plan for a major independent project that will be undertaken under the supervision of a member of the major department or program. The application form, which requires the student to articulate the independent project briefly, clearly, and with a timetable and modest bibliography, is available in the dean’s office.